Italy’s monarchy was ended on 2 June 1946 by a close referendum vote. The descendants of Vittorio Emanuele II, King of Italy, are still a part of Italian society and appear in the news regularly. Some political parties support the Italian monarchy. The House of Savoy were sovereigns in Italy, the Kingdom of Sardinia and parts of France and Switzerland for almost 1,000 years. They intermarried with the royals of other countries for centuries. Until 2002 the Italian Constitution forbade male heirs of the throne to set foot on Italian soil. Prince Emanuele Filiberto, (below) 45th in the House of Savoia dynasty, Prince of Venice and son of Vittorio Emanuele IV and Marina Doria, married French actress Clotilde Courau on 25 September 2003 in Basilica Santa Maria degli Angeli in Rome. This was the same church where in 1896 his great-grandfather, King Vittorio Emanuele III married Princess Elena Petrovich Njegosh, daughter of the King of Montenegro. Prince Albert of Monaco served as the best man. Their daughter, Vittoria Cristina Adelaide Chiara Maria di Savoia, was born in 2003. Filiberto became a TV personality and won the Italian version of Dancing with the Stars. The Savoia family reside in Corsica and Geneva. Italian royals are allowed to visit Italy now, and measures are being considered to allow them to live in Italy again. The Savoia family returned to Italy on 23 December 2002 for a private audience with Pope John Paul II, and it was Vittorio Emanuele’s first time in Italy since he was nine years old. Italy’s last reigning female monarch, Queen Maria José di Savoia, daughter of King Albert of Belgium, died in Geneva on 27 January 2001 at the age of 94. Queen Maria José was a staunch supporter of the Allies and the partisan movement in Italy during World War II along with her husband King Umberto II, who died in 1983. The former queen worked through Vatican diplomatic channels in attempts to broker a peace treaty between Italy and the U.S. before 1943. Roberto Benigni was born on 27 October 1952 in the Tuscan town of Misericordia. He was writer, director, producer and star of the 1997 tragicomedy La Vita É Bella (Life Is Beautiful), filmed in Cortona and Arezzo by Miramax Films. 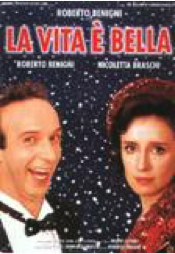 Benigni and the film were awarded Best Film and Best Actor by the European Film Awards and three Oscars in 1999 (Best Leading Actor, Best Foreign Language Film, and Best Music by Nicola Piovani) among seven Oscar nominations, in addition to 49 international awards. He played the lead role of Ivo Salvani in Federico Fellini’s 1990 film La Voce della Luna (The Voice of the Moon). In 1986 he starred with Walter Matthau in Il Piccolo Diavolo (The Little Devil) and was the star of Johnny Stecchino (Johnny Toothpick) in 1991. Fellini planned to remake Pinocchio as a collaboration with Benigni, but he died before it could be launched. Benigni was anxious to oversee the project that became his fabulous fairy tale Pinocchio in 2002, in which he starred and directed. Roberto Benigni has played in 27 films, written 13 and directed nine. He is a gifted improvisatory poet, and it’s entertaining to hear him recite Dante’s Divina Commedia (Divine Comedy) by memory. Cernobbio, Lake Como. Lago di Como, which lies at the foot of the Alps, is a celestial vacation resort. Opulent villas of the rich and famous adorn its alluring shorelines with some of the most awe-inspiring views in the world. "This lake exceeds anything I ever beheld in beauty," remarked Percy Bysshe Shelley. For over 2,000 years, poets from Virgil and Catullus to Tennyson and Longfellow have raved about the lakes of Lombardy, but it’s impossible to do justice when describing the spectacular beauty of Lake Como without visiting and understanding it. The lake is 28 miles long and never more than 2 miles wide. Private boats and ferries travel up and down the lake, offering views of the most important villas, such as Villa d'Este, Guido Monzino’s Villa del Balbianello, Villa Serbelloni--a gorgeous property of the Rockefeller Foundation, Villa Pizzo and Villa Carlotta. Winston Churchill enjoyed staying at Lake Como and spent a long painting holiday there in 1945. From the pier of the scenic town of Cernobbio, a boat ride of less than two hours transports visitors on a beautiful journey Northeast to Bellagio, "Pearl of the Lake" and one of the most picturesque villages of Lake Como. Villa d’Este. “The precise location of heaven on earth has never been established but it may very well be right here,” said Herb Caen (1916-1997), influential Pulitzer prize-winning columnist for the “San Francisco Chronicle” for four decades. Well-appointed guest rooms and plush suites with lake views. Floating pool on the lake, indoor pool with hydro massage and a spa that’s an oasis of relaxation. In terms of sheer luxury, Villa d’Este has few if any competitors. The magnificence of a bygone era is maintained intact. Villa d’Este simply added all the up-to-date facilities. Upon emerging from the revolving doors you feel the cares of the modern world slip away and the warm greetings of the staff make you feel at home. The history of Villa d’Este goes back 564 years when nuns sought refuge from a civil war and built a convent on the grounds. Cardinal Tolomeo Gallio of Como chose the venue as his private summer residence. Years later Princess of Wales Caroline of Brunswick, estranged wife of England’s King George IV, owned the villa and named it “Villa d’Este” after one of her d’Este ancestors. Gaja. Barbaresco, CN, Cuneo. Barbaresco’s designer label confirms its status as a first-order international star as well as one of Italy’s finest cellars. No other winery can boast such a stable of extraordinary wines that are so outstandingly consistent in terms of style, character and personality. Our Borsalino hats off to the dynamic Angelo Gaja, fourth generation winemaker. He is credited with turning a small family wine business into a company that produces a wine coveted around the globe with a near-cult following. (Pictured to the right ) The three stars are from Gambero Rosso and indicates Gaja has won 35 Three Glass awards, more than any other winery in Italy—one star for each grouping of ten Three Glass designation. La Cantina di Gaja was founded in the 1850’s. Born in Alba in 1940, Angelo attended the world-acclaimed Enological Institute of Alba where he graduated in 1960 with a degree in enology. Gaja also earned a master's degree in economics from the University of Torino. Angelo and his wife Lucia live in Barbaresco with their son and two daughters. Lucia plays an active role in the daily management of the Gaja Winery. “Angelo Gaja is wine´s first producer-manager-communicator, with his desire and determination to achieve top qualities, unflagging commitment and constant effort, ability to innovate and great communicational talents. This was and is Angelo Gaja, who is capable of offering wines with exceptional analytical caliber, of giving flair and elegance to Barbaresco, which, until he stepped in, had merely been a less-appreciated cousin to Barolo,” said San Pellegrino in a tribute to wine innovators. The forty six million people who visit Italy every year can now access discounts and get better quality with all the things tourists love to do: introducing the TouringCard, brought to the world by the Touring Club Italiano in cooperation with the Italian Ministry of Foreign Affairs. With this card, visitors can take advantage of numerous offers and discounts to hotels, restaurants, museums and car rentals, increase the quality of these experiences and make booking them more simple. The icing on the cake is that the card only costs 25 euros annually. If you’re planning on renting a car, then you’ve already covered the cost of the card with the Hertz discount of 15% to all cardholders. There are literally thousands of facilities across Italy that honor the card, from museums in Rome to shopping in Florence, from the Alps to Sicily. The Italian Touring Club is committed to promoting safe and sustainable tourism that to appreciates and preserves Italy’s artistic, historic, cultural and natural heritage. As part of that mission, the Club creates initiatives, such as the TouringCard, focused on accompanying the traveler during his or her voyage to discover Italy. If Italy is on the itinerary, you’d be wise to consider a TouringCard!